I absolutely love finding a new twist on an old favorite! Living in the south, collards are a stable, but “how” you cook them is pretty standard. 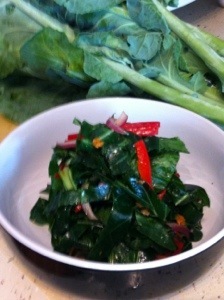 Imagine my surprise when my boyfriend and I stumbled across marinated collards at the market. I envisioned this flavorful explosion of flavors that matched the bright colors! NOT! The greens were very very firm and while the colors were great the flavor was lacking. If you don’t know me by now I am the queen of “I can make that at home”! So here we go! 1. Clean and slice the collards removing the tough stalk. 2. Add the julienned carrots, peppers, and red onions. 3. Combine the vinegar, oil, dried mustard, salt, pepper, celery seed, and honey in a sauce pan and bring to a boil. 4. Pour the sauce over the fresh veggies and toss. 5. Place the salad in a heavy place deal bag and force all the air out of the bag. 6. Marinate the salad for as little as 24 hours or up to 2 days.